LAUSANNE, Switzerland – The official tournament schedule of the eighteen-nation 2014 15U Baseball World Cup has been released, revealing that all eighteen nations will be in action next Thursday, 31 July, for the opening day. Coverage of the eighty-three matches will be enhanced by online play-by-play (i.e., CBS Game Tracker) and through social media (by following @BWC15U on Twitter and “BaseballWorldCup” on Facebook and Instagram; official hash tag #BWC15U). Broadcast details to follow. It was also announced that the Central American country -- and world No. 52 -- Guatemala (seeded 18th in the event), would replace Tunisia in Group A. 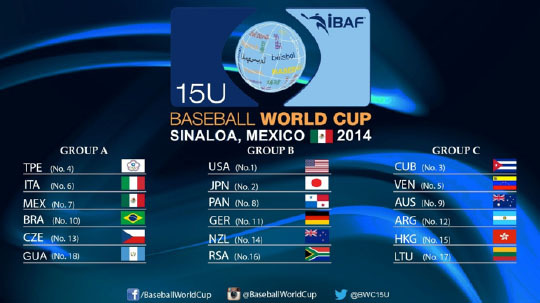 Ten of the top 15 countries in the world will have their National Teams competing in the II 15U Baseball World Cup. Nations participating include No. 1 USA, No. 2 Japan, No. 3 Cuba, No. 4 Chinese Taipei, No. 10 Venezuela (defending champion), No. 11 Italy, No. 12 Mexico, No. 13 Panama, No 14 Australia, No. 15 Brazil, No. 19 Germany, No. 22 Argentina, No. 27 Czech Republic, No. 28 New Zealand, No. 29 Hong Kong, No. 31 South Africa, Guatemala and No. 54 Lithuania. The spread of the II 15U Baseball World Cup will span the globe, covering Africa, the Americas (including the Caribbean, North-, Central and South America), Asia, Europe and Oceania. It will be the first time either top-ranked USA or Japan has confirmed participation in the 15U Baseball World Cup. Other first-time participants include Australia, Czech Republic, New Zealand, Panama and South Africa. Launched in 2012 by the International Baseball Federation and played every two years, the 15U Baseball World Cup has established itself as the pinnacle of baseball in this age category, like the 12U Baseball World Cup. And also like the 12U event, the 15U Baseball World Cup is the only world championship across all of sport to feature National Teams in this age group. Past players who have competed on the youth Baseball World Cup platforms include Canada’s Brett Lawrie, Japan’s Yu Darvish and Shohei Ohtani, South Korea’s Shin-soo Choo, Cuba’s Yasiel Puig and Aroldis Chapman, and USA’s Clayton Kershaw, Justin Upton and Buster Posey, among countless others.